This was uttered on a sports radio show (of course). 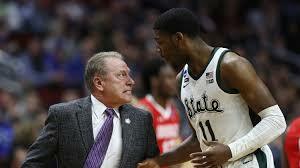 The speaker was talking about Tom Izzo and his rant at his players during the NCAA tournament. It is a nice mashup of “browbeat (someone) into (something)” (bully or initmidate) and “beat (someone) over the head (with a fact or opinion)” (emphasize or repeat something strongly). The word “browbeat” originally (1580s?) meant “to bear down with stern or arrogant looks,” and later became a term used for “bullying”. A big thanks to John Kooser for hearing this one.